Hello! 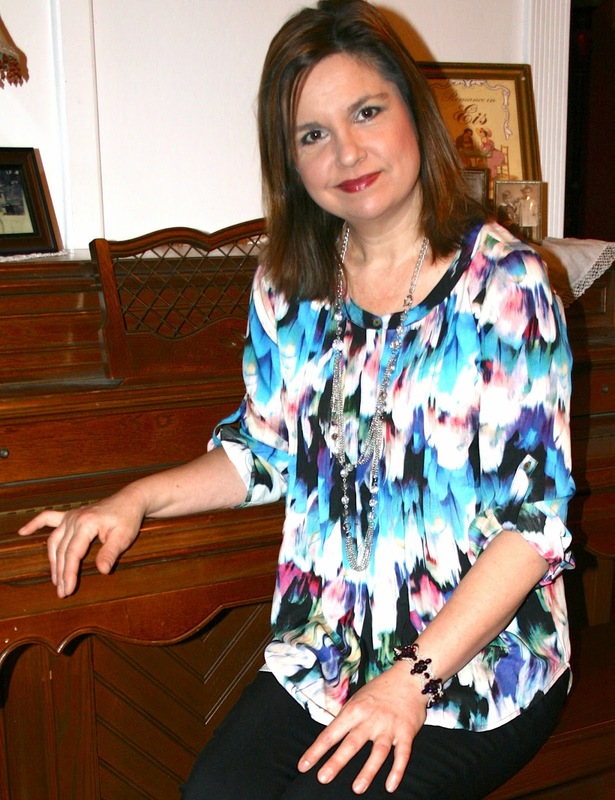 For this week's Fashion Over Fifty post, I wanted to show you what I got in my latest Stitch Fix. For those of you who are not familiar with the Stitch Fix Company you can read all about them in this post HERE. To keep myself from getting into a style rut, I like to schedule a 'fix' with Stitch Fix about three times a year. For this fix, I got some really interesting pieces that I was quite happy with. 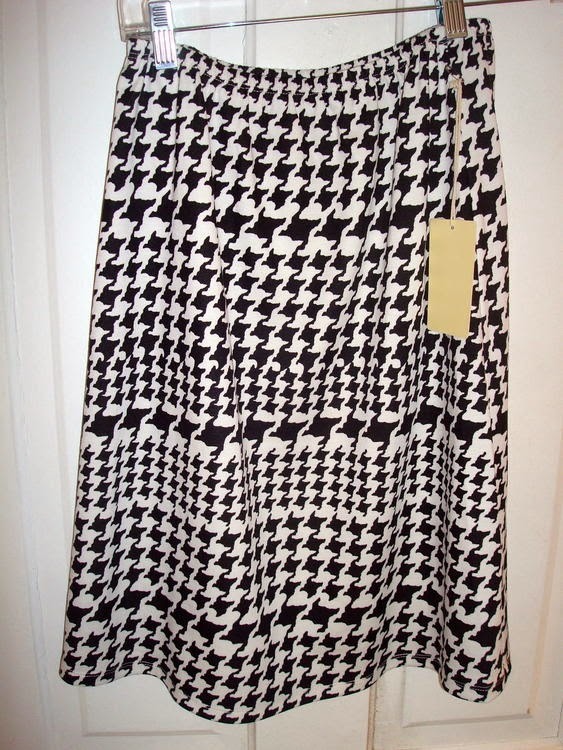 My first item was this Jay Houndstooth Print Swing Skirt. I really love this skirt because it is made of a cool and comfortable knit material, and the colors and style will work for all seasons. I can wear it in the spring and summer months with a white tee, tank, or shirt (or add a colored shirt for an extra pop), and I can also wear it in the winter months with black tights and a cardigan. Perfect! My second item was a Benni Dotted Striped Knit Shirt. 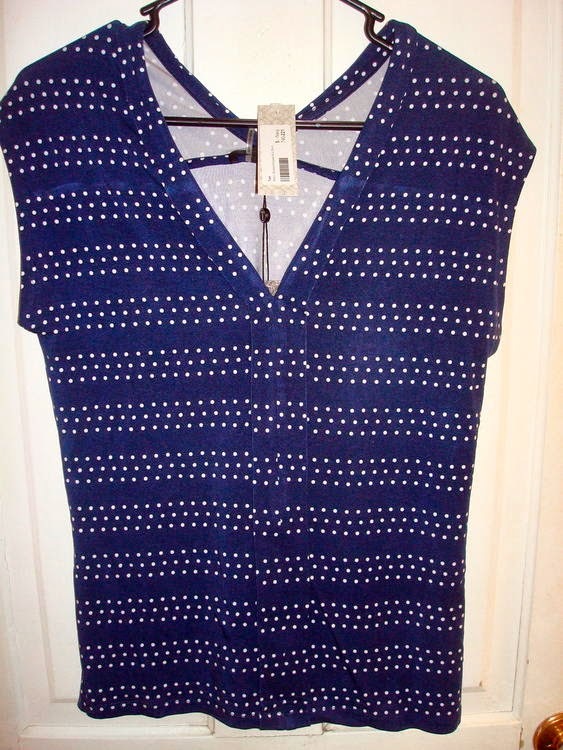 It is also not only very comfortable, but I think the dots formed into stripes is a really interesting contrast and it also has a unique neckline and pleat in the front. 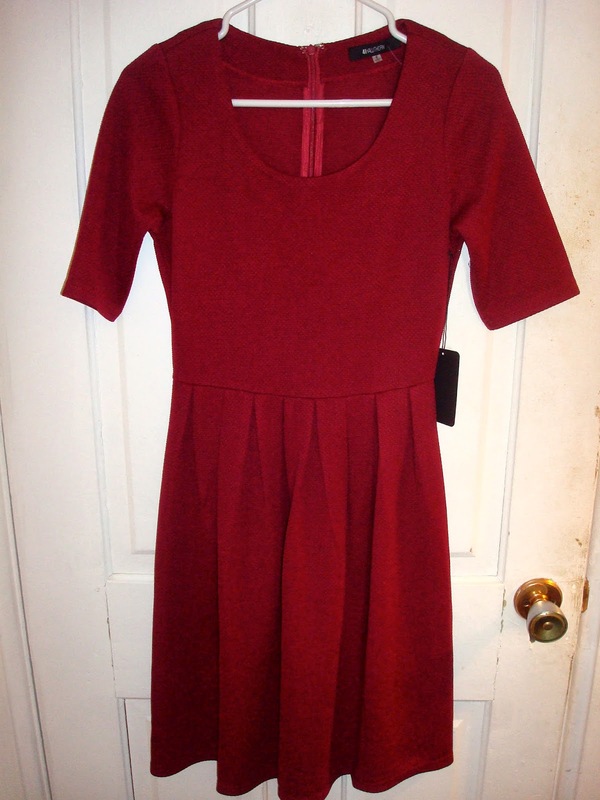 The third item I received was this burgundy dress. Now, I've ordered from Stitch Fix a total of three times and I've never returned anything, but this dress I had to return. I really like the dress, it is very thick and has a very nice texture to it; but I knew from the second I pulled it out of the box that it wasn't going to work. You see, I have an apple figure: big on top, small on the bottom, and this style of dress NEVER fits me for it's made for a woman who is small on top and bigger on the bottom. But I tried it on anyway, like Stitch Fix requests, and sure enough, it didn't fit. I couldn't even zip it. I thought, maybe I should just wait till my husband comes home, and he can try and zip it closed (I have a few dresses that require that), but I changed my mind because at my age I'm all about comfort and I felt like I would be wearing a straight jacket if I wore this dress. Also, because I have a long torso, the pleats of this skirt hit shortly below my ample bust instead of at my waistline, making my already large tummy appear even larger. So, long story short, I can never, ever, ever, wear this style of dress and whenever I see this style of dress in a store, I don't even bother trying it on because I know it won't work. So I sent it back. Now, here's the catch to sending things back; even though it costs nothing to send an item back and you are not charged for it, if I would have KEPT the dress, my entire order would have been $10.00 less than what I paid.. The reason being, if you keep all five items in your fix, you get 25% off your total order. I wrote Stitch Fix and told them it wasn't fair. I wasn't sending the dress back simply because I didn't like it; the dress was just too small and the style was inappropriate for my body type. But I didn't get a response. In hindsight, I wish I would have kept the dress and donated it to Goodwill or given it away as Blog Candy: I'd be $10.00 richer and someone would be very happy with a brand new designer dress. I will have to remember that if it ever happens again. Now for my final two Stitch Fix items, which were my absolute FAVORITE items I received. When I pulled this blouse out of the box, I squealed in delight. It is SO different, and something I would have never picked out for myself, but I LOVE it. It is a Bilson Pleat Detail Abstract Feather Print Blouse. Being a bird lover, I not only love the feather print, but the beautiful colors and almost a watercolor look to it. Even though it is a size small, it is a very large, loose, and flowy blouse so it does make me appear bigger on top than I probably really am, but I'm willing to live with that because I just adore the blouse so much (it's also perfect for those PMS days LOL!). The colors and material are perfect for all seasons. I can wear it now with black pants (I already did! ), or I can wear it in the summer with a white skirt and maybe a loose belt. It is very versatile. The fifth item I received in my fix were these Emer High Waisted Cropped Trousers. Now, I really didn't need another pair of black pants, but when I tried these on I loved the look and feel of them so much I kept them. They are so comfortable and so slimming. I like them more than any other pair of black pants I already own, so I would rather get rid of one of my current pairs of black pants and keep these. The fit and feel of these pants are FABULOUS! I bought these radiant orchid velvet rhinestone loafers at Charming Charlies in the fall and have never worn them because the color is so different they never went with any of my outfits. 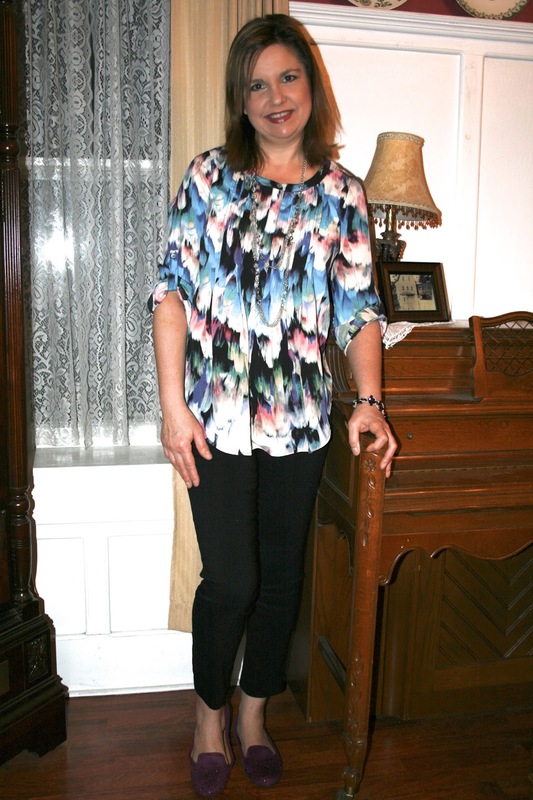 But with this feather blouse, there are so many colors in it, I could finally wear my shoes! Here is a close up of the blouse so you can see the beautiful detail of the feathers. Just gorgeous! It was hard to select jewelry to go with this busy blouse and scooped neckline, but I finally settled on a long Tori Spelling silver and clear rhinestone chain, and a black and clear crystal bracelet. The skirt is so cute, and I love the feather blouse and black pants! Stitch Fix seems like such a great program. The shirt and black pants would have been my favorite things too. I love the design of that shirt! You got some lovely additions to your wardrobe, love the flowing blouse and dark pants. The red dress had me written all over it, very much something I would wear. We are all such different shapes are we not:O)! Have a great day!